The Newest Rant: Zombies VS Robots to Become a Movie. Despite Ingrained Cynicism, I Am Excited. Zombies VS Robots to Become a Movie. Despite Ingrained Cynicism, I Am Excited. It has been announced that the popular Chris Ryall-written and Ashely Wood-illustrated series, "Zombies Versus Robots," has been optioned as a movie. It involves a little girl (possibly the last human on earth) being protected by robots from--what else--zombies. Look, I know I've made comments about how the only thing more over-done lately in movies and comics than zombies is vampires, but despite my usual tendency to be cold and logical, I am actually excited for this movie. Why? 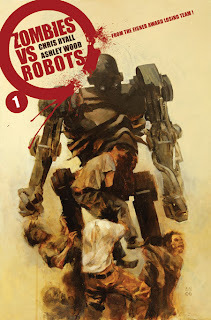 Maybe it is because I enjoyed the art of Ashley Wood so much that a part of me hopes a movie is just as awesome, or its the kid in me that jumps for joy at the prospect of watching zombies and robots tear each other apart. Whatever the case I am giddy. Wait, what? Michael Bay is involved? The guy who does good special effects but otherwise makes sucky movies like Transformers? My enthusiasm just dropped by two points.